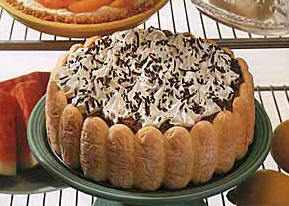 Line bottom of 9-inch-diameter springform or cheesecake pan with ladyfingers. Line sides of pan with ladyfingers, standing ladyfingers side by side and rounded side out. Stir 3/4 cup whipping cream, unsweetened chocolate and 1/4 cup sugar in heavy small saucepan over low heat until chocolate melts and mixture is smooth. Remove saucepan from heat and cool to room temperature. Using electric mixer, beat 1 cup powdered sugar, butter and 1 teaspoon vanilla in large bowl until blended. Beat in cooled chocolate mixture. Combine remaining 2 cups cream, 2 tablespoons powdered sugar, 1 teaspoon vanilla and cinnamon in another large bowl. Using clean dry beaters, beat until firm peaks form. Fold half of whipped cream mixture into chocolate mixture. Spread half of chocolate filling in ladyfinger-lined pan. Top with layer of ladyfingers, then remaining chocolate filling. Pipe or spread remaining whipped cream mixture over filling. Sprinkle with grated semisweet chocolate. Refrigerate until firm, at least 3 hours. (Can be made 1 day ahead. Cover and keep refrigerated.) Remove pan sides from cake and serve.